In almost every detail this was an identical machine to Beocord 1700, the only difference being that Beocord 2200 came ready fitted with the Dolby B noise reduction unit. In a rare break with their restrained style, B&O chose to flaunt this by writing “Beocord 2200 Dolby System” on the front edge of the machine, where the more basic version only said “Beocord 1700”. Text copyright © Beocentral. Unauthorised reproduction prohibited. 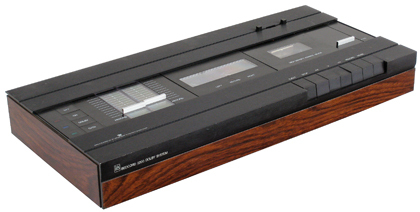 Beocord 2200 was for a time the finest Beocord cassette recorder available, though it was very expensive, costing nearly as much as the Beogram 4000 tangential tracking turntable. Text copyright © Beocentral. Unauthorised reproduction prohibited.